Beginning more than 1.5 million years ago, early humans made stone handaxes in a style known as the Acheulean – the longest lasting tool-making tradition in prehistory. New research led by the Max Planck Institute for the Science of Human History and the Saudi Commission for Tourism and National Heritage has documented an Acheulean presence in the Arabian Peninsula dating to less than 190,000 years ago, revealing that the Arabian Acheulean ended just before or at the same time as the earliest Homo sapiens dispersals into the region. Much attention has been given to understanding the spread of our own species, Homo sapiens, first within Africa and then beyond. However, less attention has been given to where diverse groups of close evolutionary cousins lived in Eurasia immediately prior to the arrival of Homo sapiens. Understanding this is critical because the spatial and temporal characteristics of such groups reveal the human and cultural landscape first encountered by our species on leaving Africa. In a paper published in Scientific Reports, an international team of researchers led by the Max Planck Institute for the Science of Human History and the Saudi Commission for Tourism and National Heritage reports the first ever dates obtained from an Acheulean site in Arabia, the site of Saffaqah, situated in Central Saudi Arabia. Saffaqah is the first stratified Acheulean site to be reported in the Arabian Peninsula and the dates reveal that early humans occupied the site until at least 190,000 years ago. These dates are surprisingly recent for a region known to feature among the oldest examples of such technology outside Africa. For example, dates from the Levant document an ancient Acheulean presence from 1.5 million years ago. Conversely the site of Saffaqah features the youngest Acheulean tools yet found in southwest Asia. Over 500 stone tools, including handaxes and other artefacts known as cleavers, were recovered from the occupation levels. Some of the stone flakes used to make handaxes were in such fresh condition that they were recovered still resting on the stone nodules from which they had been detached. These and other artefacts show that the early humans responsible for making them were manufacturing stone tools at this site. “It is not surprising that early humans came here to make stone tools,” says Dr. Eleanor Scerri of the Max Planck Institute for the Science of Human History, the lead author of the study. “The site is located on a prominent andesite dyke that rises above the surrounding plain. The spot was both a source of raw material as well as a prime location to survey a landscape that, back then, sat between two major river systems.” This choice location also seems to have continued to be attractive to early humans at an even later date than those recorded by the researchers in this study. Layers containing identical stone handaxes are also found above the dense occupation layers that were dated, raising the possibility that Saffaqah is among the youngest Acheulean sites documented anywhere. The new dating results both record the late persistence of the Acheulean in the Peninsula and also show that as yet unidentified hominin populations were using networks of now extinct rivers to disperse into the heart of Arabia during a time of increased rainfall in the region. This suggests that these hominins were able to live on the margins of habitable zones and take advantage of relatively brief “greening” episodes in a generally arid area. The dispersal of these hominins into the heart of Arabia may also help to explain the surprisingly late persistence of the Acheulean, as it suggests a degree of isolation. To date the sediments from the site of Saffaqah, the researchers used a combination of dating techniques known as luminescence methods, including a newly developed infrared-radiofluorescence (IR-RF) dating protocol for potassium rich feldspars. The method relies on the ability of such minerals to store energy induced by natural radioactivity and to release this energy in the form of light. “The application of IR-RF dating allowed us to obtain age estimates from sediments that were previously difficult to reliably date,” explains Marine Frouin of the University of Oxford, one of the researchers involved in the dating program. These discoveries and methods are already leading to new research. “One of the biggest questions we have is whether any of our evolutionary ancestors and close cousins met up with Homo sapiens, and if this could have happened somewhere in Saudi Arabia. 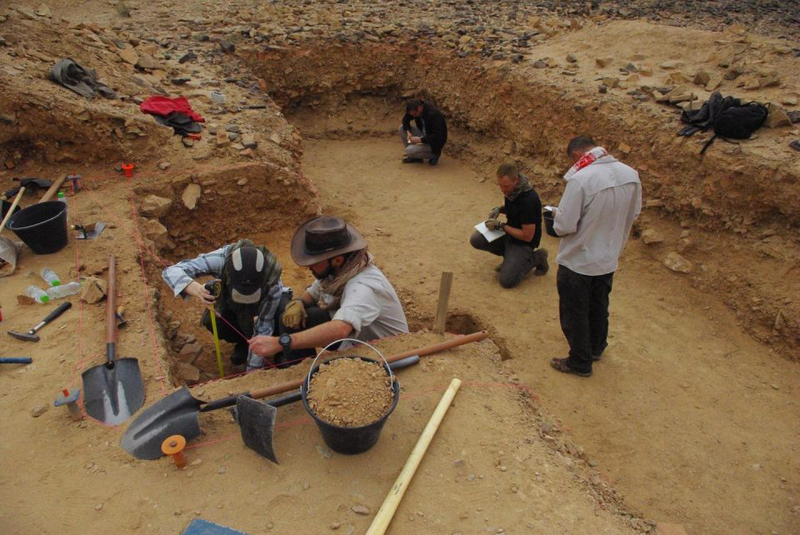 Future field work will be dedicated to understanding possible cultural and biological exchanges at this critical time period,” says Professor Michael Petraglia of the Max Planck Institute for the Science of Human History, the director of the project which led to the discoveries at Saffaqah.